Valley Beth Shalom Harold M. Schulweis Day School, a K-6 Solomon Schechter elementary school, offers a superior education and enriching foundation for life’s journey. Students thrive in an environment that focuses on academic excellence, strong Jewish values, a dynamic community, and personal growth. Students reach their learning potential guided by talented teachers through individual learning approaches and small group instruction. Is to empower each child to reach his/her potential as a confident, skilled, and passionate learner with a strong Jewish identity. Exceptional, forward-thinking academic general and Judaic studies programs emphasize inquiry, critical thinking, and creativity while instilling Jewish ethics, values, spirituality, a personal connection to Israel, and a strong sense of social responsibility. Embraced by a nurturing and dynamic community, our students build a foundation that fosters academic achievement, celebrates the joy of Jewish life, and cultivates a desire to make a difference in the world. Like our namesake, Rabbi Harold M. Schulweis, we emphasize social action and spiritual transformation, he taught us that "God is a VERB". Just as God takes action, so must we. 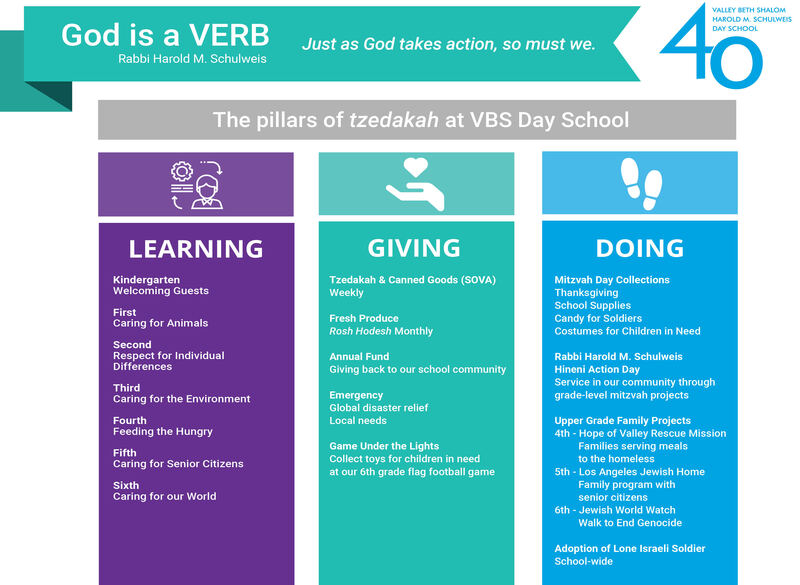 To learn about the Pillars of Tzedakah at VBSDS, click here. We prepare students to root down with a strong foundation through learning, giving and doing. Our highly academic curriculum emphasizes creativity, collaboration, critical thinking, problem-solving and also embraces inquiry, Hebrew language, and the rituals and values central to Jewish identity. All of this leads to a student who is prepared to live and lead as an enlightened mensch!